It’s not every day that you get to see some of the animals at Wellington Zoo for free but a section of the huge Southern Walkway allows you to do just this. Parking just off Russell Terrace, the walking track leads you up past a skatepark (previously Newtown Skating Rink), popular with kids (and adults) who are usually reasonably confident on their boards, the ramps (often improvised) get moved around as needed to perform tricks! 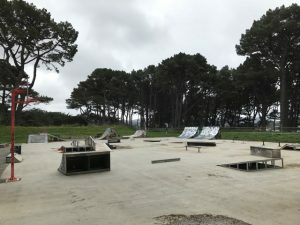 This skatepark got a $12,000 upgrade in 2016 that was completely funded through Pledgeme. Winding through the trees, you go round the back of Newtown Athletics Park and then follow the fence line of the zoo. Get your kids to keep their eyes peeled and they might be lucky enough to spot chimpanzees (in the distance), emus, ostrich, giraffe and baboons amongst others. Obviously non of this is guaranteed and it’s a little more tricky than seeing these animals from the zoo, so it might be best to leave telling the kids until you can see something and then surprise them. If nothing else, you should be able to hear animal chatter and it can be fun trying to decide what animal is making the different noises. 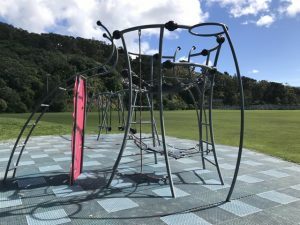 There are lots of tracks that wind through Mount Albert and Newtown Parks but if your kids are in need of a playground to encourage them to walk, head towards Melrose park. There’s a large playing field which the Zoo fence line forms one border to and here the animals are easier to see (emu, baboons and goats at the time of our visit). There are also ‘Danger keep out’ signs which can be quite exciting for the kids! At the far end of the playing fields there’s a small playground with a seesaw, swings (including for preschoolers), climbing structure (as pictured), small slide and spinner. To continue the loop walk, follow the Zoo fence line round past the ‘meet the locals’ section, following a stream and coming out at the side of the zoo. To return to the skatepark, walk round the front of the zoo, through the carpark past the athletics field and up the stairs. This walk is great for those that need incentives for their kids (spotting animals, the playground and for older kids, the skatepark). It’s steep in places but never for long and plenty of shaded sections as the paths weave in and out of trees. The walk suggested here can easily be extended e.g. with a side trip to Truby King House and Gardens. 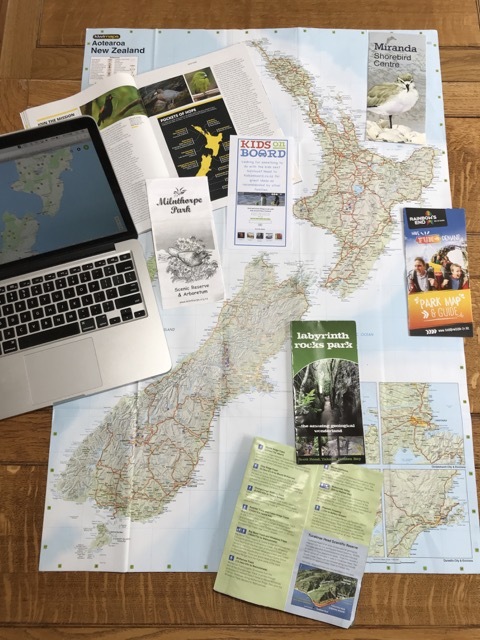 The website link shows all of the Southern Walkway tracks. A lot of these are NOT suitable for buggies and can be very muddy when it’s been raining. Address: one option is to park just off Russell Terrace. The first left heading south, takes you to a carpark at the bottom of the skatepark and has plenty of spaces for free parking.